While the magic of Americas favorite playground entertains the imagination from morning to night, there is a resort in Orlando that delights it by creating memories that stay vivid long after you leave this Florida oasis. 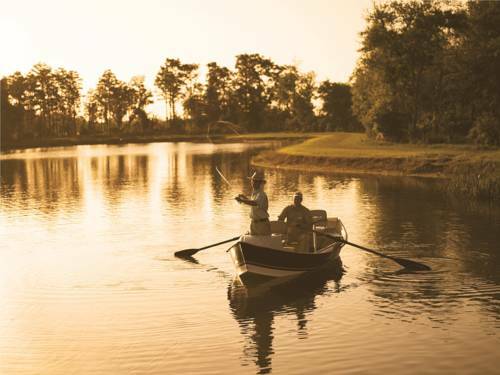 Bordered by Shingle Creek, the Headwaters of the Everglades, The Ritz-Carlton Orlando, Grande Lakes envelops you into 500 acres of natural beauty, a luxurious retreat where you can surrender to the serenity of our relaxing spa, indulge in fine dining, or play 18 holes on our golf course, a Certified Audubon Cooperative Sanctuary. With exceptional amenities and impeccable service, one of the most breathtaking luxury hotels in Orlando is the perfect place to relax, meet or experience the wedding of your dreams, all while enjoying the quintessential all-American city. Highball & Harvest: Southern inspired cuisine and hand-crafted cocktails. NORMAN'S: Norman Van Aken is internationally known for his innovative New World Cuisine. First Drop: Enjoy locally roasted coffee, fresh juices, handcrafted milkshakes and smoothies as well as small bites.including breakfast and lunch sandwiches. The Lobby Lounge: For cocktails and light fare with views of unbelievable sunsets. Bleu Pool Bar: Poolside restaurant and bar featuring casual cuisine, snacks and cocktails. Vitale, Spa Caf : Featuring healthy cuisine including power drinks, smoothies, great salads and a great selection of waters. Fairways Pub: Featuring clubhouse fare, and a great selection of draught beer and scotches.